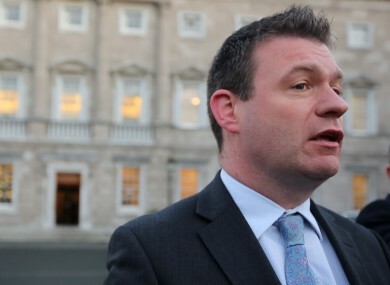 ENVIRONMENT MINISTER ALAN Kelly cancelled a meeting with a cross-party group of Dublin city councillors about the housing and homelessness last week, it has emerged. A meeting between Kelly and the leaders of each political group on the city council had been scheduled for last Wednesday, 26 November, but it was cancelled on Friday, 21 November because of the situation with Irish Water and water charges. Kelly has since organised a forum on homelessness to take place at the Department of Environment in the Custom House tomorrow. But he has not said specifically whether the councillors due at last week’s cancelled meeting are invited to that event. Kelly had arranged a meeting with the leaders of each political party grouping on Dublin City Council that was to take place on Wednesday, 26 November at 2.30pm in the Mansion House, but it was cancelled five days before it was due to take place. “Minister Kelly’s office has just phoned to cancel next Wednesday’s meeting,” an email from Lord Mayor Christy Burke’s office to council group leaders on Friday, 21 November said. Ironically, it was last Wednesday that Kelly announced the government’s strategy for solving long-term homelessness. But Fianna Fáil councillor Paul McAuliffe accused Kelly of “prioritising the glamour of a launch and a press release over the practicalities of meeting with group leaders”. McAuliffe said that Kelly “should have prioritised a meeting with the councillors” and added: “We’re interested in finding short-term solutions and the minister didn’t respond to it. Kelly said that various different people had cancelled on him when it came to “whole range of meetings on social housing and homelessness issue” in recent weeks. “I’ve no problem meeting with those people at all,” he said of the councillors but said the amount of those who attend tomorrow’s forum would have to be “within reason”. Email “Alan Kelly cancelled a meeting with councillors about homelessness because of water charges”. Feedback on “Alan Kelly cancelled a meeting with councillors about homelessness because of water charges”.